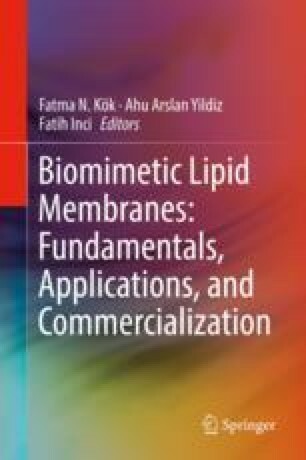 The exploitation of lipid membranes in biosensors has provided the ability to reconstitute a considerable part of their functionality to detect trace of food toxicants and environmental pollutants. Nanotechnology enabled sensor miniaturization and extended the range of biological moieties that could be immobilized within a lipid bilayer device. This chapter reviews recent progress in biosensor technologies suitable for environmental applications and food quality monitoring. Numerous biosensing applications are presented, putting emphasis on novel systems, new sensing techniques, and nanotechnology-based transduction schemes. The range of analytes that can be currently detected include phenols, insecticides, pesticides, herbicides, heavy metals, toxins, allergens, antibiotics, microorganisms, hormones, dioxins, genetically modified foods, etc. Technology limitations and future prospects are discussed, focused on the commercialization capabilities of the proposed sensors.